As any hiring manager in the tech world can attest, finding a highly qualified UX designer can be daunting. With organizations consistently focusing on being leaner and more productive, many are seeking out job candidates who can bring the most skills to the table to avoid having to hire an entire team. With this in mind, more tech companies don’t just want a UX designer; they want what’s known as a UX unicorn. And while there’s some debate about whether or not these people even exist, that doesn’t stop them from trying to find one. What is a UX Unicorn? Mythical user interface design architect with an advanced adaptive skill range. Highly skilled in graphic design, prototyping wireframes, CSS3, HTML5, jQuery, multivariate testing, use case scenarios, marketing, and branding. Fluffy horse with a horn projecting from it’s [sic] head, bluish shoes, ribbon neck thing, and a blinking eye. Another answerer noted that a UX unicorn can solve not just user interface woes, but can also fix poor strategy decisions, lack of management vision, lack of funding, and a complete lack of design thinking. A tall order for just one job title! So in a nutshell, a UX unicorn is someone who goes above and beyond the typical job description of a UX designer. They are expected to have multiple skills across innovative product design while being leaders, problem solvers, and coaches for their teams and the organization. While some UX designers know a lot about a little or a little about a lot, UX unicorns know a lot about a lot. While the description of a UX unicorn is daunting, it’s important to remember that their role usually falls more on the side of management than coding. According to some industry experts, UX unicorns should excel at code but take a more active role in managing and collaborate with their teams. What Do UX Unicorns Have in Common? Most of the rare individuals who fit the “unicorn” description will have formal education in visual design, informational architecture, technical writing, or interactive design. However, the most successful UX unicorns are those who have gained a lot of hands-on experience at work. Formal schooling may provide them a fundamental knowledge base, but the ones who truly shine are those with challenging career backgrounds that have tested and improved their skills over time. The primary difference between typical UX designers and a UX unicorn is that the mythical unicorn can branch out beyond their expected skill sets. Typically, they are the ones who are dedicated to always making themselves more valuable to their organization. There is no one-size-fits-all definition of a UX unicorn because that phrase will mean different things based on an employer’s organizational needs. While Paysa doesn’t have a page for UX unicorns, we can provide some insights into the career paths of the highly talented folks who work in UX. 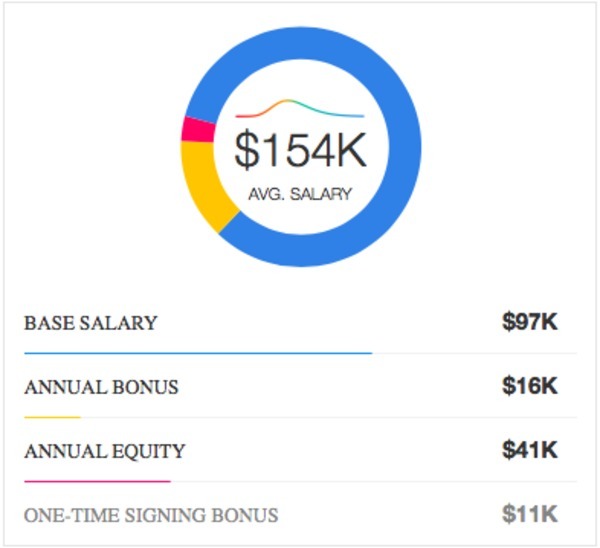 Early in their careers, UX designers earn a high annual income. According to Paysa’s data collected from 29K profiles, a newly minted UX designer can command between $93K and $173K a year. The average market salary is $132K a year. This includes $82K in base salary and $34K in annual equity, a sign-on bonus of $10K, and an annual performance bonus of $15K. Average UX designer salary, per Paysa data. 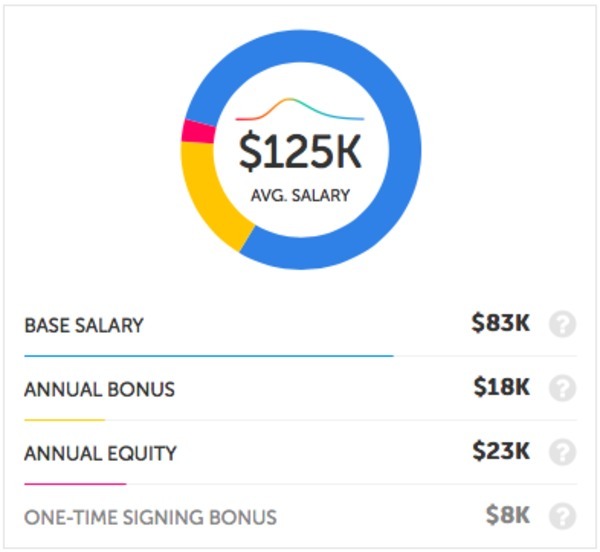 Breakdown of average UX designer salary, per Paysa data. A skilled design manager can command between $93K and $159 per year in annual compensation with the average salary being $125K. This includes an annual base salary of $83K, an annual bonus of $18K, $23K in annual equity, and a sign-on bonus of $8K. Average design manager salary, per Paysa data. Breakdown of average design manager salary, per Paysa data. A UX design lead is known to earn between $112K and $198 per year in annual compensation with the average salary being $154K. This includes an annual base salary of $97K, an annual bonus of $16K, $41K in annual equity, and a sign-on bonus of $11K. Average UX designer lead salary, per Paysa data. Breakdown of UX designer lead salary, per Paysa data. Now that we’ve gone over what separates unicorns from the herd and what they can expect to earn let’s talk about the skills involved in becoming one. Those who are interested in this field should focus on learning the principles of UX design and consider taking an online class to grow their skills. 53% of applicants must know user experience. 50% also must know Photoshop. Other top required skills include User interface design, graphic design, CSS, and web design. 41% of applicants must know Photoshop. 36% also must know graphic design. Other top required skills include Illustrator, web design, Indesign, Microsoft Office. 63% of applicants must know user experience. 52% also must know user interface design. Other top required skills include web design, CSS, Photoshop, graphic design. While some people become UX unicorns without a degree, most have some formal education and at least a bachelor’s degree. Here is the educational attainment breakdown for different positions within the UX world. There are three times more applicants with a bachelor’s degree than those with a master’s. 51% of applicants have a bachelor’s. 47% have no degree. 16% have a master’s. 1% have a doctorate. There are three times more applicants with a bachelor’s than those with a master’s. 58% of applicants have no degree. 42% have a bachelor’s. 11% have a master’s. 1% have a doctorate. There are three times more applicants with a bachelor’s than those with a master’s. 49% of applicants have no degree. 49% have a bachelor’s. 15% have a master’s. 1% have a doctorate. Being collaborative and proactive: going the extra mile and getting help from peers when you need it. Experience partnering with clients: being able to communicate the rationale behind your choices while remaining open to other’s suggestions. Empathy: the ability to put yourself in the shoes of clients and end-users. Being detail-oriented: no matter what you do, make sure it’s polished and professional. Intellectual curiosity: the ability to absorb information and inspiration from the world around you, whether it’s from your peers, your clients, or your own life experiences. Whether you’re just getting started or already well-established in your career, you should be looking toward not just being a UX designer, but a UX unicorn to keep your edge in the increasingly competitive tech job market. While no magic spell will turn someone into a unicorn overnight, your best bet is always to be learning new skills and seeking new opportunities for growth. Interested in learning more? Get started at paysa.com.